The blood flow was studied by introducing into the vessels of the stomach and mesenteric intestine of dye and x-ray contrast agents (orografii, kardiotrast, a suspension of bismuth in glycerine, one solution of methylene blue). At different times after surgery studied the nature of the implantation of the graft, scar formation, macro – and microscopic changes. Slices with a thickness of 5 to 8 microns were stained with hematoxylin-eosin and van gieson and HART. Coloring nervous elements were produced by Gros Bilovskom. The results showed that the area of the intestine to the vascular pedicle, sewn into the defect of the various divisions of the stomach, well vivet and retains its macro – and microscopic structure. Destructive changes or scar regeneration in the layers of the graft within the specified period. 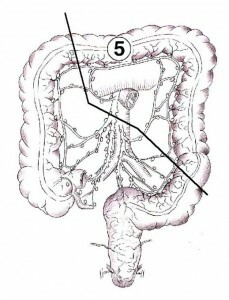 Section of the colon from the serous membrane becomes almost complete similarity with the wall of the stomach, which is particularly well expressed by the end of the third year of observation. The best conditions for healing was observed when compound bodies single nodal seam from gigroskopicheskii threads or using suture-glue joints, which does not hurt and does not disturb the blood supply of stitched bodies. In the early stages after surgery, where he used two – and three-row seams of absorbent threads, found a more pronounced swelling of the connective tissue stroma of the mucosa compared with one double-row sutures from gigroskopicheskii threads. The integumentary epithelium in places was clusen, glandular deformed cells, secretory granules often have not been determined. The development of granulation tissue and blood vessels is delayed and appears more clearly at day 7-8 after surgery. Regeneration of blood vessels in the rumen occurs earlier (4-5 days) in the area of anastomosis, single-imposed nodal seam of synthetic fibres.